It’s always Christmas when Cube is here! While I prefer the ridiculous shenanigans of Vintage cube, I’ll draft damn near any cube you could think of and be thrilled about it. 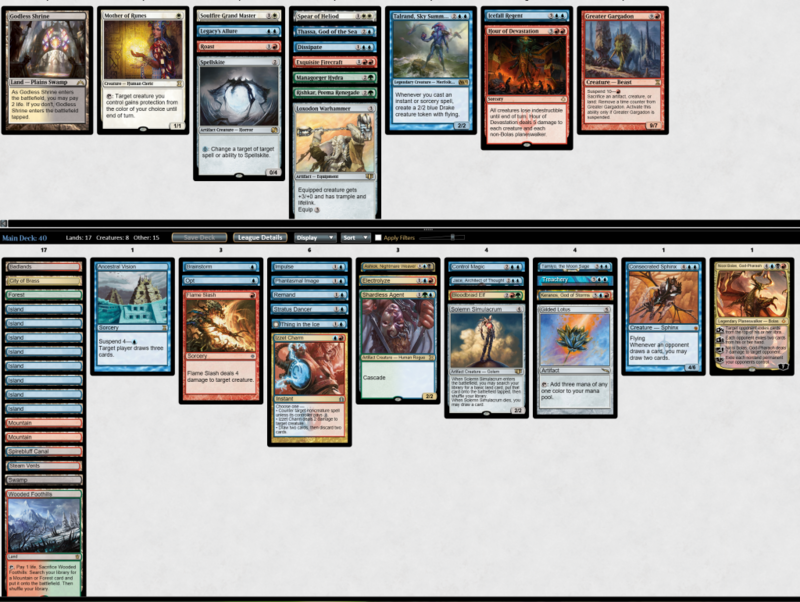 Drafting Cube is a lot different from drafting ordinary formats. Every single card is playable on some level, and everyone’s deck is powerful by default. You can certainly wind up with mediocre, or even below-average decks, but it’s a lot easier to wind up with some kind of playable pile that can squeak out a win or two. Because it’s so deep in power level, Cube also offers you the unique opportunity to draft according to your own preferred style. If you enjoy playing aggro, you can almost always find an open lane to draft some kind of aggressive deck. The same is true with grindy, planeswalker-centric midrange decks, ramp decks, blue control decks, and even combo decks like Splinter Twin or Sneak & Show. Also because of Cube’s power level, prioritizing mana fixing is a very good strategy. It may not seem like Misty Rainforest is the most powerful card out of a pack containing flashy planeswalkers, wrath effects, and burn spells, but a lot of the time it will be. Casting all your powerful spells on time makes the difference between turning the corner and dying to a well-crafted aggro deck. Furthermore, because Cube contains such a high density of powerful cards, picks you spend on manafixing aren’t as impactful as they might be in a regular draft format where you might only see 26 playable cards in your colors. Cube also rewards sideboarding, again because there are so many playable cards. If you know how to sideboard, and draft the good sideboard options, you have a leg up on the competition. So with that introduction, let’s check out my drafts for the week! This draft shows off the power of mana-fixing, fetchlands in particular. I don’t even think my mana was particularly good, but if I drew the Wooded Foothills, the world was my oyster, as it fixed for black (Badlands) and blue (Steam Vents) in addition to the default of red or green. My first pick was Treachery, followed by Consecrated Sphinx. Both of these are, in my opinion, two of the most powerful cards in the cube. Legacy Cube is much more creature-centric than Vintage Cube, and being able to steal a big threat while leaving up interaction or doubling up with a big threat of your own makes Treachery a high pick in my eyes. Consecrated Sphinx is one of the best finishers for any blue deck, because even if it gets removed, you’re up two cards most of the time. If it sticks, you claw so far ahead that you can bury your opponent in raw cards. Just don’t deck yourself. Splashing the two cascade creatures was a little suspect, but I actually had quite a lot of value lower on the curve, Ancestral Vision being the biggest target. I was only main-decking one counterspell (Remand), so I felt okay playing the cascaders. Round 1, I played against a weird UR tempo deck that was playing Lightning Greaves. While it did win the game for my opponent in game 2, it was effectively a mulligan in the other games. They were playing Chandra’s Phoenix, Stormbreath Dragon, and Thundermaw Hellkite, along with burn spells. You don’t need Lightning Greaves for those guys to do their thing. I would advise against playing das boots if you can avoid it. 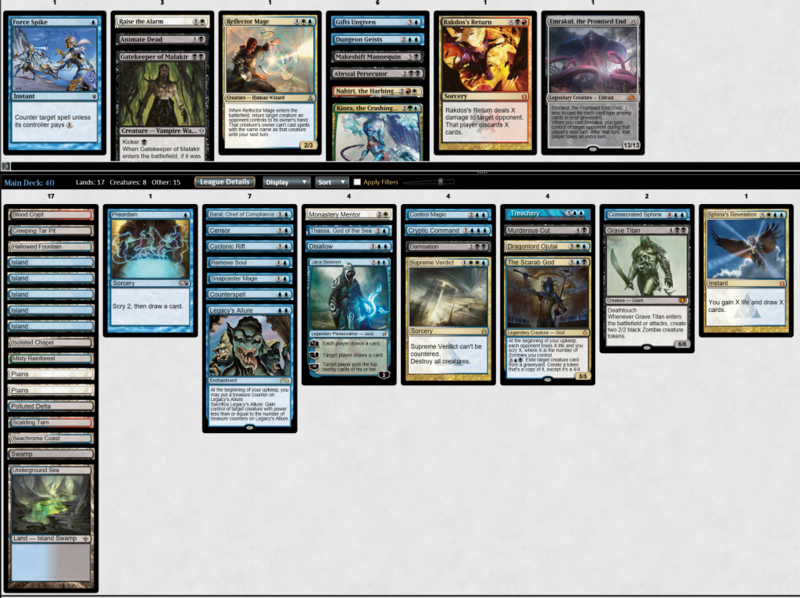 Round 2, I played against RG ramp, which is a pretty good matchup for a planeswalker-centric control deck. I lost game 1 to an unchecked Rofellos, Llanowar Emissary, which is one of the most potentially broken cards in the cube. Game 2, I had the Roast for their turn-2 Rofellos, and Hour of Devastation to clean things up, both out of the sideboard. My opponent’s last effort, an 8/8 Verdurous Gearhulk, made a juicy little Treachery target and went the distance. Game 3, I opened on Ancestral Vision and had a Thing in the Ice that I flipped for a mid-combat blowout after my opponent tapped mana in their first main phase. Round 3 I 2-0’d a monowhite aggro opponent. Thing in the Ice took over game 1. My opponent had a turn-1 Mother of Runes in game 2, which is a major problem for control decks. However, I was able to target the Mom with Izzet Charm on their end step, then untap with Hour of Devastation after they tapped her to lock up the 3-0. Off to a good start! Opposition is one of my favorite cube cards. 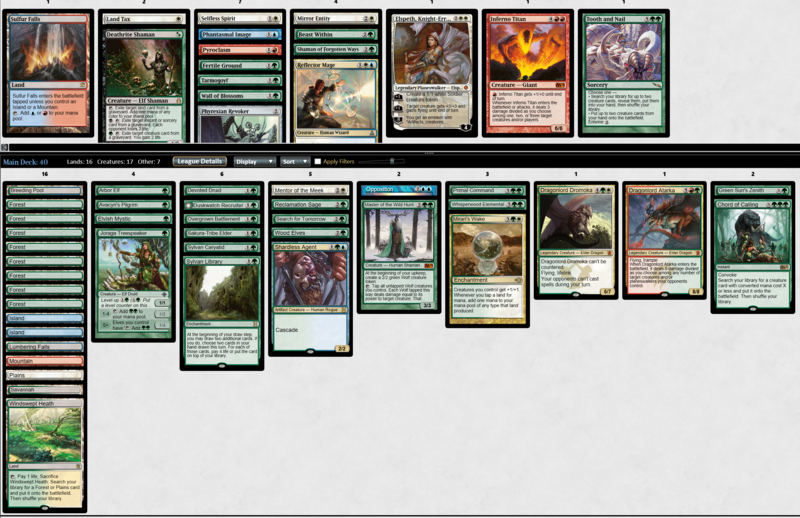 Green ramp strategies are already powerful because a lot of the colorless fast mana of Vintage cube is gone. Spitting mana dorks onto the table and resolving the game’s best 5-, 6-, and 7-mana spells before your opponent is capable of dealing with them is a great way to win. Opposition is another of the game’s most powerful spells, capable of locking your opponent out of ever casting another spell if you can put enough bodies onto the table, which the green decks are trying to do already. Game 3 my opponent had Bitterblossom again, and this time they had removal for my first few threats. Selfless Spirit came down the turn before I was going to Atarka, and that was that. Round 2, we played just one game. My opponent conceded the match because they had only 3 minutes left on the clock after decking on only turn 8. They had gone off with Consecrated Sphinx and had a billion cards in hand, but I had a Whisperwood Elemental that was keeping them from sweeping the board. They were new to Magic Online, I think, and took a long time to make plays. It would have been interesting to get more games of this matchup, but alas, we only got one. 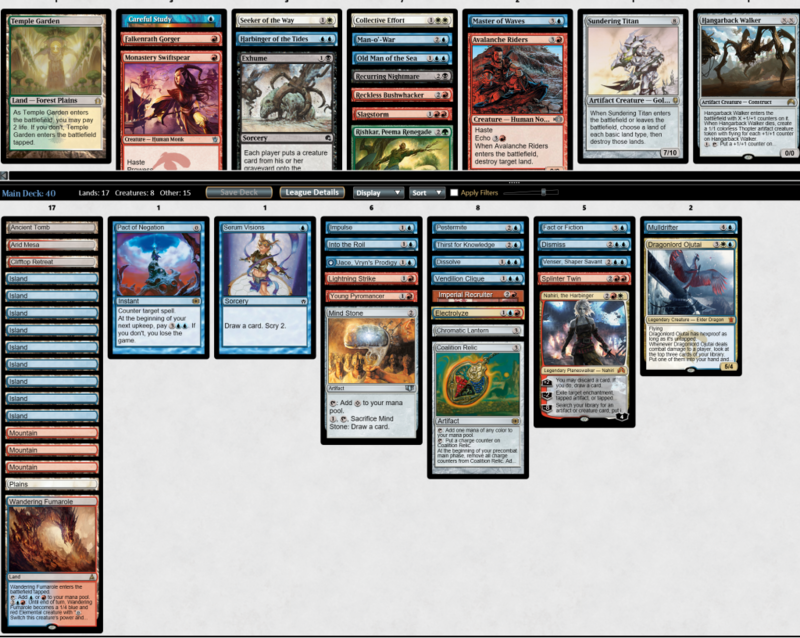 Round 3 was against a Naya Midrange deck. I never saw a Splinter Twin or Kiki-Jiki, Mirror-Breaker, but I did see Zealous Conscripts and Restoration Angel, so they probably had at least Kiki in there somewhere. Game 1, Opposition was just too fast for them and locked them out. Game 2, they had Dromoka’s Command to kill Opposition. I followed up with Inferno Titan, which they answered with Elspeth, Sun’s Champion. Dragonlord Atarka cleaned up the Elspeth, but they had Eternal Witness to get her back, and I was unable to produce any more threats. Game 3, my opponent had an early Qasali Pridemage, but I sandbagged the Opposition until I was ready to win tap them out and win the game off of an unchecked Whisperwood Elemental. My opponent chose to kill my Sylvan Library with Dromoka’s Command, rather than have their 4/6 Courser of Kruphix eat my Whisperwood, which proved a costly mistake. I hesitate to call this a Splinter Twin deck because I mostly won on the back of Dragonlord Ojutai. It turns out I am very good at hitting both Splinter Twin and Pestermite off of a Fact or Fiction, and not one of my opponents was nice enough to put them together in the split. I played some pretty fun and interactive games, but ultimately came up short against a pair of aggressive monowhite decks. Besides Ojutai, the deck didn’t have any good ways to turn the corner, and it didn’t have any sweepers beyond Slagstorm to claw back from behind. No redundancy made the combo very inconsistent. I did make one sweet play, which was untapping Ojutai with Pestermite’s trigger in response to removal. Not much else to say here. Reactive cards like counterspells are fine in Cube, but you really need some sort of catch-up spells, especially against decks like monowhite that get on the board fast and early. Now this is podracing. My first picks were, in order: Underground Sea, Misty Rainforest, Consecrated Sphinx, Cryptic Command, and Jace Beleren. This is exactly where I want to be in draft, and getting the both Treachery and Snapcaster Mage early in pack 2 was just icing on the cake. I wish I’d had a few more early plays, but I had a pair of sweepers that let me come from behind, and some threats that would clean up very quickly. As a side-note, this was some of the best mana I’ve ever had in Cube. Even had the Creeping Tar Pit as an uncounterable, unblockable threat in grindy mirrors. Round 1 was a blue control mirror, but my opponent’s threats were Frost Titan and Icefall Regent, while mine were The Scarab God and Dragonlord Ojutai. They were unable to compete with the raw card advantage. Unfortunately, as Magic sometimes does, I mulliganed thrice in two games in round 2 and got manascrewed both times against a creature-based midrange deck that could never in a million years have beaten me in fair Magic. That’s why we play the games instead of just comparing decklists! Round 3 was odd. Game 1, my opponent played a pile of RW lands, a Coldsteel Heart on black, a Chromatic Lantern, and a Mind Stone. Before dying to Monastery Mentor and friends, they revealed a Tetzimoc, Primal Death but I countered it and we were off to game 2. I mulliganed and never hit land 3. They killed me with Restoration Angel and Zealous Conscripts, which made me think they were on some sort of Twin combo, but without any countermagic to back it up. I felt pretty good heading into game 3. In game 3 they played a Blossoming Marsh. I hadn’t yet seen any green cards. On the play and without fear of dying to Pestermite or Deceiver Exarch, I was able to tap out for a Nahiri the Harbinger, but it was met with Anguished Unmaking for my opponent. I got stuck on lands and was unable to deploy threats while keeping myself protected from potential combos, so I just sat on a hand of Counterspell and Snapcaster, with a cycled Censor in the yard. I let a Resto Angel resolve and hit it with Murderous Cut on their end step. They also seemed to be stuck on 4, so I took a calculated gamble and slammed Dragonlord Ojutai when I made it to 5. They didn’t kill me, and Ojutai quickly cleaned things up when backed up by countermagic. Not a bad start, averaging a 2-1. That’s all you really need to do in Cube, since each 2-1 gets you your entry fee back, so it’s a good place to be. I drafted lotsa blue and lotsa green, which is pretty typical for me in cube. I’ll draft aggro decks occasionally, but I tend to shy away from midrange decks because I just feel like it’s so easy to go over the top of them in such a powerful format. Plus, they just aren’t as much fun to play as some of the other archetypes. I either want my opponent dead, or I want to be the one doing the fun stuff. Monoblack is the exception to that, since it packs proactive disruption like Hymn to Tourach, Thoughtseize, and Liliana of the Veil. Cube is here for another several weeks until the 25th Anniversary set drops. While I don’t like the lack of key reprints, I am stoked to force Horseshoe Crab + Quicksilver Dagger or Heavy Arbalest in the phantom queues.